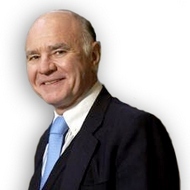 Marc Faber has over the years developed a highly successful persona as Dr Doom and is the author of the well-read Gloom, Boom & Doom Report - though anyone acquainted with him will know he is anything but gloomy. Those anticipating more gloom from him were not disappointed yesterday as he delivered the final keynote speech at the CLSA Investor Forum. His message since the financial crisis has been fairly consistent. He has railed against the current policies of the US Federal Reserve and other central banks in the developed world which have resorted to printing money as a way out for the financial crisis that engulfed the world in 2008. Western economies have been hijacked by neo-Keynesian economists. They argue that expansionary monetary policies are necessary to boost economic growth rates through inflation and by inflating asset prices. However, Faber argues that these polices make it impossible for economies to grow rapidly. Indeed, living standards are falling. "I believe we are in the midst of the generation that for the first time in Europe, US and Japan will die poorer than their parents," he said. As he has said before; "When you print money it benefits few people. Those with assets such as property and stocks get richer, while the rest see their cost of living rise while their wages do not go up commensurately."